What more beautiful place to arrive on your private jet charter, than the rolling hills of Montenegro? As you flying into Podgorica or Tivat airport on your private jet charter to the mountains soar upwards through the azure sky, smothered with lush green forestry and surrounded by the bluest waters. Montenegro has always been a favourite haunt of the rich and famous, first discovered in the 1960s by Richard Burton, Elizabeth Taylor and Sophia Loren. The compact but varied country is home to an incredible scenic coastline and a mountainous northern region. An increasingly popular luxury vacation destination, you will not be disappointed by the array of stunning scenery and opportunities presented in Montenegro. Situated in a crook of the Bay of Kotor, between looming mountains, is the gorgeous coastal town of Kotor. The town is barely discernible from a distance against the backdrop of the brooding mountains. Once darkness falls, lights illuminate like a halo around the town and the sturdy Venetian fortifications that surround it, as they refract from the water below. Kotor is famed for its winding marbled lanes, which are lined by a maze of shops, restaurants and churches. 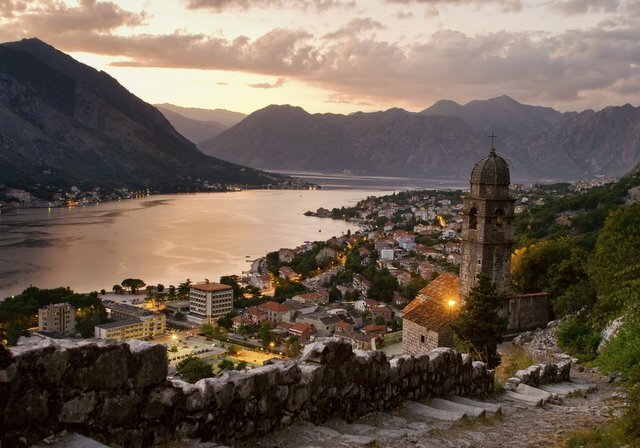 Alive with architecture, romance and antiquity, you will delight in all Kotor offers. This particularly exclusive bay sees many yachts pouring into the marina during the peak of summer. At the foot of the Međed Peak, is Durmitor’s principal attraction: Black Lake. Easily accessible from the centre of Žabljak town, the Black Lake is actually comprised of two smaller lakes, Big Lake (Veliko jezero) and Little Lake (Malo jezero). A strait joining the two evaporates during the summer season, causing there to be two separate, beautiful lakes once again. Witness the overwhelming sight of Black Lake, as it calmly lies, reflecting the mountains in its near wave less surface. A popular destination for hiking, as well as the incredible views, there are a myriad of mountain trails that lead to other hidden lakes around Žabljak. Climb and hike amongst the bracken, the thick branches of sumptuous greenery angling towards you; feel the fresh air awash your lungs. Kolašin, Montenegro’s main mountain resort, provides more prestigious accommodation than Durmitor. Skiing dominates through the winter months and hiking during the summer. Head to Trg Borca for a truly wonderful trek, with the option of three paths, you can head in to the Bjelasica Mountains! Starting at the ski centre is a 16 km trail that loops and meanders around, providing you with some wonderful sights of thick forests and across the mountains. You can route through the deep, green forest to Mt Ključ, and then continuing along the trail to Zekova Glava you pass Lake Pešić, and walk beneath Bjelasica’s highest peak! Circling back, the trek takes you to the spring, which is the source of the Biogradska River, before you make your way up Troglava! A potentially exhausting expedition, but well worth the beauty, magic and splendour that is on offer! After weaving your way through the humbling trek and wondrous spectacles, help yourself to a delightful dinner at Konoba kod Rada Vlahovića in Kolašin. Situated in the square, that was the heart of the old Turkish town, this pastoral eatery providing you with delicious Montenegrin cuisine. You can delight in the traditional foods, such as cicvara, a creamy polenta, and popara, a bread-based porridge. It also has tender lamb that just melts in your mouth. Call our customer service team on +44 (0) 20 7169 4231 or email us at fly@bespokeaircharter.com to arrange your private jet charter to Montenegro.